This review has been printed in the March 2018 issue of Chess Life. A penultimate (and unedited) version of the review is reproduced here. Minor differences may exist between this and the printed version. My thanks to the good folks at Chess Life for allowing me to do so. Timman, Jan. Timman’s Titans: My World Chess Champions. Alkmaar: New in Chess, 2016. PB 320pp. ISBN 978-9056916725. Once a haven for the geeks and oddballs among us, chess has taken on a new and more positive valence in the modern social imaginary. Chess is marketed to parents as a propaedeutic to academic achievement for their children, and as a source of important non-cognitive skills like ‘grit.’ The current US Chess mission statement – “empowering people through chess one move at a time” – highlights the benefits of playing more than it does the game itself. Today’s leading players also bear the signs of this shift. Top tournaments are broadcast live across the world via YouTube and Twitch, and the competitors explain their wins and losses with sage-like equanimity, their sponsorship deals prominently featured on their blazers. ‘Lesser’ Grandmasters and Masters are riding the e-sport wave towards exclusive streaming deals and video series. Scholastic chess has become a growth industry: coaches and camps proliferate, and it seems like half the players at big tournaments are juniors. Surely this newfound respectability is beneficial for American chess. But is it an unalloyed good? Is nothing lost when the chess world is transformed into a wholesome, family-friendly environment? I think back to my first steps in the chess world, back to evenings at the public library in Merrick, NY, where I was the only person in the room under 40, and where I lost game after game to old Russian men who regaled me with wonderful, unprintable jokes. It was a space where the teenaged me wasn’t quite supposed to be, but I was there anyway, and I was learning to fit in. You might think about your experiences at large tournaments like the US Open. The reputable players play their games, go back to their rooms, and get ready for the next round on their computers. Gone are the days of all-night blitz benders in the skittles room. Gone are the days of the pub crawl and the hangovers destroying the next day’s play. Worst of all, the postmortem is a relic, an antiquity, offered only by the aged and accepted even less frequently. Those that do occur are haunted by a third party – the ubiquitous Stockfish app, lurking, correcting, standing as the ultimate authority. Jan Timman’s newest book, Timman’s Titans: My World Chess Champions, is many things at once: a set of sketches of ten world champions, a study of their styles and games, a catalogue of Timman’s own dreams and memories. At its heart, however, I think Timman’s Titans is an elegy for what has been lost, for better and for worse, in modern chess, and a deeply personal remembrance of a world that no longer exists. As with most elegies, and here I follow Coleridge, it reveals equally the greatness of its subjects and its author. This is Timman’s best book to date. Timman’s Titans consists of (a) personal remembrances of each of the world champions from Alekhine through Kasparov, (b) a discussion of their games and careers, and (c) highlights of Timman’s own games against the champion in question. The analysis is insightful and extremely well done, but the real reason to buy this book is for Timman’s memories and memorials. Timman knew all of the champions he discusses save Alekhine, and he played against six of them in serious competition. The chapter on Alekhine, despite the handicap of never meeting him, is a particular highlight. We journey with Timman to Lisbon, Portugal, where Alekhine spent his final years. We accompany him on his wanderings through the snowy town, and we are present as he stumbles upon one of Alekhine’s own chess sets in a tiny junk shop. Here, more than anywhere else in the book, we get a sense of Timman the flâneur, and the writing is evocative of no less than W.G. Sebald or Teju Cole. Of the nine remaining champions, Karpov is the subject of the largest chapter, at just over 50 pages. This is not terribly unexpected, as Timman faced Karpov more than anyone else in his career – some 115 games, according to my database. The chapter on Smyslov reveals a shared love of studies and justifies Genna Sosonko’s claim of a stylistic affinity between the two men. For me, however, the most interesting sections are those on Euwe and Tal. Books are a constant reference in Timman’s Titans. We learn that a book on Botvinnik (Botvinnik Teaches Chess by Müller) was an early influence, and Euwe’s Judgment and Planning in Chess was an introduction to “strategic planning.” Later books by Alekhine (My Best Chess Games 1924-1937) and Smyslov (Selected Games) were of great importance. Euwe, whom Timman could never bring himself to address by his first name, is described as bearing a “colossal authority,” as indefatigably hard-working and (despite the odd over-the-board blunder) eminently logical. For his part, Euwe tried to help Timman where he could, setting up contacts for an early tour of the Soviet Union, and quietly contributing rather large sums of money to the “Timman Committee” that aimed to support an assault on the World Championship. It is clear that that Timman greatly admired Euwe, despite some sharp differences in personality between the two men.Where Euwe was solid and respectability, the young Timman was a bon vivant, someone who “hung around in shabby cafes… surrounded by shady types” (55) and who used a threadbare fur coat as a makeshift sleeping bag. Discipline and sobriety were not in his nature. Indeed, as Timman tells us, his attempts to emulate Botvinnik’s “spartan” training methods before his first Grandmaster tournament failed horribly, and it was only after he returned to his “trusted, unhealthy” lifestyle that he began to win. Perhaps Timman’s admiration for Mikhail Tal, “a type of romantic player that has disappeared,” (111) can be traced to their similar outlook on life. He seems to take delight in describing his first encounters with the Seventh World Champion, how he succumbed to the famed “hypnotizing power of Tal’s eye” (110) in their first game in 1971, and how he spent a drunken evening getting the better of Tal in a 1973 blitz match. Ischa Meijer (a well-known TV journalist at the time in the Netherlands – translator’s note) had come to Hastings to interview me. … Meijer described how Tal interrupted our conversation, saying: ‘Jan, don’t tell them about our lives.’ The interviewer reported: ‘A while later, he has to be carried off.’ My father, who had great respect for top chess players, was upset by this short sentence. How did the interviewer dare to write something like that? I have to admit that I find the pathos of this passage almost unbearable. It is testament to the strength of Tal’s demons and the challenges of living under the Soviet regime, but more than that, it is emblematic of broader societal changes in the intervening years. Our knowledge of public health (rightly) stigmatizes smoking, an activity that permeates Timman’s Titans, and the ‘romance’ of addiction is much withered. Luckily for Timman and for us, he seems to have learned to moderate his vices, allowing him to write this book, and us to enjoy it. This review was originally meant to have included discussion of two other books, but Timman’s Titans is so rich, so packed with stories and insights, that twice my allotted page space would not have done it justice. I do not think it controversial to say that this is one of the best chess books published in recent years, and players of all strengths would find it of great interest. What may be more controversial are my concerns – mild as they may be – over the direction of modern chess. I offer this olive branch to those who disagree with me: you can, barring the unforeseen, find me in the bar after the evening rounds at this year’s US Open in Madison. Come visit. I’ll buy you a drink, and we can shoot the breeze while we play some blitz or eavesdrop on someone’s postmortem. Do me a favor, though – don’t come too late. I can’t stay out all night like I used to, and I’ll have meetings and another round to get ready for in the morning. This entry was posted in biography, Game Collections, history, navel-gazing and tagged Jan Timman, Timman's Titans on March 2, 2018 by fullcityplus. Of all the unexpected benefits and opportunities that have come through book reviewing, surely the most humbling has been my appearance on the Perpetual Chess Podcast. Ben Johnson has interviewed giants of modern chess like Bartholomew, Nakamura, Polgar, Watson, Yermolinsky, and the Shahades. And now he’s gone and ruined it all by talking to me. You should listen to the episode in its entirety to bask in the glory (haha) of my genius, but I did want to take the opportunity to make a few notes here about the experience and the things I forgot to say. 1. For new readers and visitors – welcome! Glad you liked what you heard enough to click the link and join us. These reviews appear in the outstanding Chess Life magazine, and I wholeheartedly recommend that you subscribe to the print edition of Chess Life, either as part of your membership with the US Chess Federation or as a stand-alone product. 2. Ben is located in Pittsburgh and I’m in Omaha, so we did the interview over Skype. The sound quality is excellent, my ‘ums’ notwithstanding, and very few edits to the conversation were made. 3. As soon as the EP was over, I was horrified that I’d not mentioned Boris Gelfand’s two books from Quality Chess, Positional Decision Making in Chess and Dynamic Decision Making in Chess. Both are among the finest chess books in print, mainly for advanced players but with ideas and lessons accessible to any serious student of the game. John Watson’s Secrets of Modern Chess Strategy and Chess Strategy in Action also went unmentioned, and that omission is scandalous. 4. I was surprised to find that I didn’t include Kasparov’s My Great Predecessors or GK on GK series in my book list. I suspect that this is because I ultimately find them to be rather overrated. There’s entirely too much computer analysis for my taste, and the history is not earth shattering enough to make up for it. Revolution in the 70s is the only exception to this – it’s an excellent work, and the interviews are priceless. 5. The way I describe chess in Nebraska makes it sound as if there are no strong players in the state. That’s patently false, as we have a lot of talent here in Omaha and in Lincoln. The problem is that our pool of players is small, and so we’re always fighting each other for the same circulating rating points. 6. My wife is at least as powerful as Petrosian’s, if not quite so conniving. There was a day a couple of years ago when my wife said that chess was becoming something of a career for me, or, perhaps better, a vocation. In saying this – and she’ll never admit it, but I think she knew exactly what she was doing – she was giving me license to view it as such. It gave me license to mourn my slow-motion exit from the academy, and also to look forward towards an identity that did not wrap itself up in my aborted PhD studies. Most of us, if we’re honest, know deep down that we’ve ‘married up.’ I really married up. Thank you, Anna, for everything. 7. Last week’s guest Mark Crowther is a true hero of contemporary chess and you should donate to his efforts with The Week in Chess at his website. My thanks to Ben for asking me to be on the Pod, and my very deep thanks to you for (a) listening and (b) reading. This entry was posted in navel-gazing on February 20, 2018 by fullcityplus. This review has been printed in the October 2017 issue of Chess Life. A penultimate (and unedited) version of the review is reproduced here. Minor differences may exist between this and the printed version. My thanks to the good folks at Chess Life for allowing me to do so. Aagaard, Jacob. Grandmaster Preparation: Thinking Inside the Box. Glasgow: Quality Chess, 2017. ISBN 978-1907982354. HC 408pp. There was a moment at this summer’s Paris Grand Prix involving Magnus Carlsen and Maurice Ashley that, besides being meme-worthy, was revelatory of the nature of competitive chess at the highest levels. There was a time in chess history when these ‘smooth’ wins actually took place. If we look at the games of Capablanca or Alekhine, for example, we find precisely the kinds of talent mismatches that produce ‘smooth’ victories. The opposition often failed to recognize deep positional threats until it was too late, with the result being that many of these early contests are paradigms of strategy and attack. Numerous teachers recommend the collected games of Capablanca and Alekhine (among others) for precisely this reason. 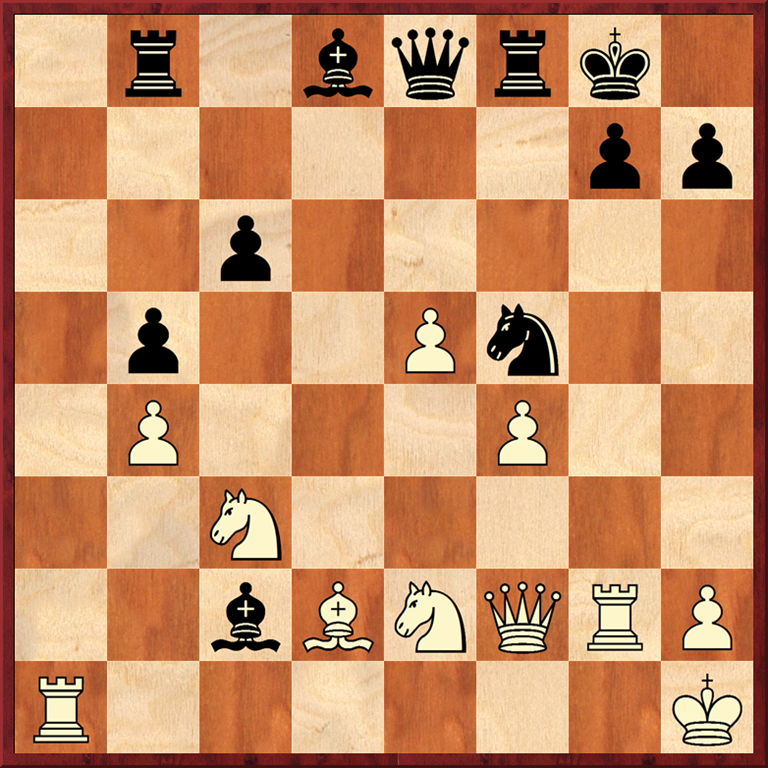 Modern chess is not nearly so neat and tidy. With the wide dissemination of information in print and electronic form, and with the ubiquity of the computer, we have seen something of a leveling of the playing field at the highest levels. Players are much ‘wiser’ than they used to be, and what Alekhine once said of himself – that to defeat him, you had to win in the opening, the middlegame, and the ending – is true of all of today’s elite. But Carlsen is still the World Champion, and he still wins more than he loses. How? There seems to be something of a consensus: what Carlsen does better than his opponents is solve problems. Instead of relying on a store of killer opening novelties, Carlsen is content to try and find positions that he understands better than his opponents, and use his superior decision making skills to successfully outplay them. It may not be ‘smooth,’ but it seems to work. Isn’t this, at its core, the nature of competitive chess? The player who makes better decisions over the course of a game or, less charitably, who makes fewer bad ones, will usually come out on top. Training our decision making abilities would therefore seem to be critical for success in over-the-board play, and improvement would, quite literally, require that we rewire the way we think. Such considerations have long been at the heart of Jacob Aagaard’s oeuvre. In one of his first books, Excelling at Chess, Aagaard implored his readers to think like humans instead of machines, sketching an approach to chess improvement on the basis of that key insight. He compared the differences between amateur and professional thinking in Inside the Chess Mind. And he served as the occluded co-author of Boris Gelfand’s Positional Decision Making in Chess and Dynamic Decision Making in Chess, both of which received high praise in these pages. Aagaard’s latest book, Grandmaster Preparation: Thinking Inside the Box, is the sixth and final volume in the Grandmaster Preparation series and in many ways its lodestar. The title, a cheeky nod to Doctor Who, is also emblematic of Aagaard’s approach to improvement. It is only through the steady sharpening of basic chess skills, many already in our conceptual toolboxes, that we can begin to make better decisions and ultimately improve our results. 1. Automatic moves, or “decisions [that] you can make quickly.” (113) These might be theoretical openings or endings, forced moves or recaptures, etc. We are warned to double-check that the move is indeed automatic, and then to make it. 2. Simple decisions, which are largely intuitive and involve choosing between multiple candidate moves. These decisions rely less on calculation than on intuition or principle, and at some point, players simply have to guess when choosing the ‘best’ move. 3. Critical moments, where “the difference between the best and second-best move is large.” Aagaard usually compares these to algebra exams. Critical moments can only be decided through intensive calculation, and any inaccuracy can lead to failure. 4. Strategic (or “complex”) decisions involve difficult positions that resist being decided through any of our individual decision-making skills (calculation, intuition, theoretical knowledge, general principles, bald hunches). All of our tools must be brought to bear on these positions, but ultimately, we have to guess here too. I happened to attend this year’s US Open in Norfolk as I was reading Thinking Inside the Box for this review, and it was constantly on my mind during my games. One position is particularly pertinent in this regard. 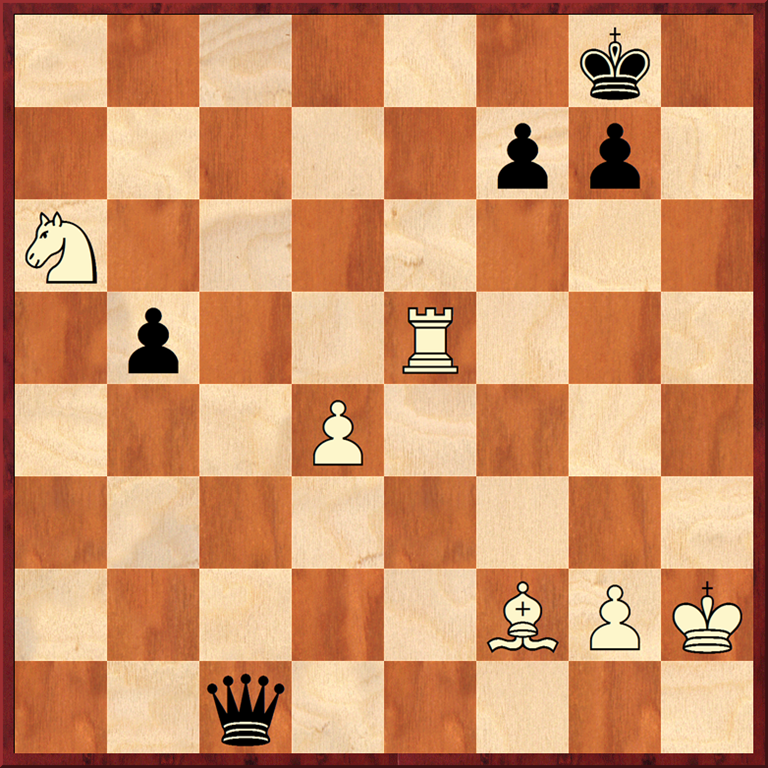 Here, in my 7th round game, I had the White pieces, and my opponent had just played his 32nd move. After 33.Rc2! Rxc3 I realized that I had encountered a critical moment in Aagaard’s sense of the term, one where a miscalculation could turn what had once been a winning position into a draw. I correctly decided that I had to look as deeply into the position as I could, burning through 15 of my remaining 25 minutes in the process. What I discovered was that after my intended 34.Rxc3? the position was drawn: 34. ..Bxc3 35.Rc1 e2 36.Kf2 e1Q+ 37.Rxe1 Bxe1+ 38.Kxe1 Kxe6 39.Ke2 Ke5 (39. ..b5! 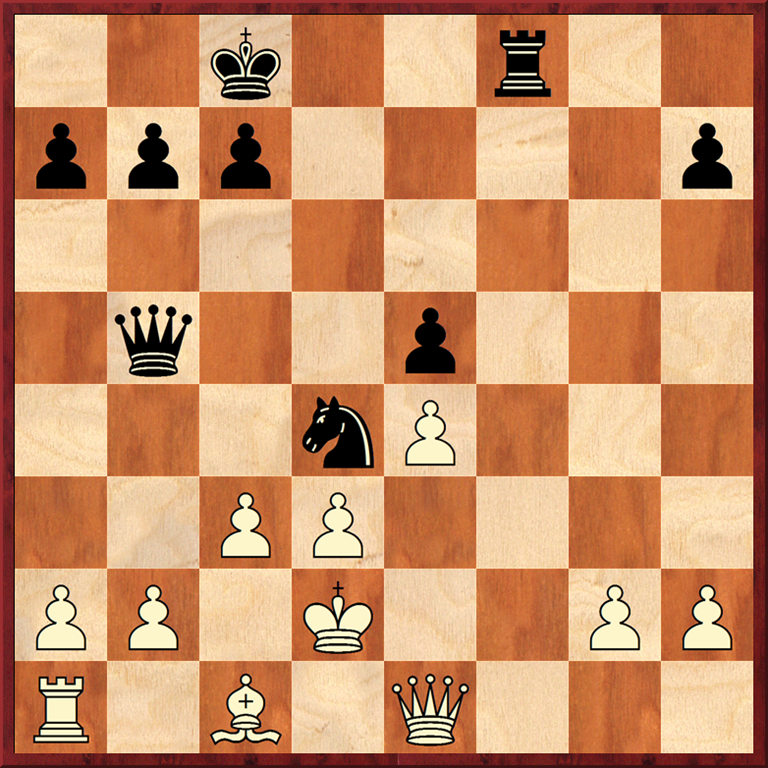 is also equal) 40.Ke3 b5!=. Luckily for me, there was an alternative, and I found the much superior 34.Rac1!. After 34. ..Rc5? (34. ..Bd4 35.Kf1; 34. ..e2 35.Kf2) 35.Rxc5 bxc5 36.Rxc5 e2 (36. ..Bd4 37.Rc1 e2+ 38.Kg2 Kxe6 39.Kf3 Kd5 40.Kxe2; 36. ..Kd6 37.e7!) 37.Rc1 Bd4+ (37. ..Kxe6 38.Kf2) 38.Kg2 Bc3 39.Kf2 my opponent resigned. That some may view this example as an automatic decision instead of a critical one is a strength of Aagaard’s system and not a weakness. By focusing on decisions and moments instead of positions, he highlights the first-person nature of decision making in chess, as well as the ways in which effective training can sharpen those decisions. This is the practical upshot of Aagaard’s methods. In studying the nature of our decision making and considering our specific strengths and weaknesses as players (Chapter 3), we can try to locate and correct our personal weaknesses. I have discovered that I struggle with simple decisions, calculating too much and taking too much time in doing so. You cannot imagine how liberating it was to read that even Grandmasters have to regularly guess, and with this admonition firmly in mind, I have managed to limit my time trouble woes in recent games. Aagaard’s discussion of the nature and limits of calculation (Chapters 7-8) was similarly illuminating. Borrowing heavily from the work of Daniel Kahneman in Thinking Fast and Slow, he distinguishes between two modes of thought: System 1, which is “fast, automatic, frequent, emotional, stereotypic and subconscious,” and System 2, which is “slow, effortful, infrequent, logical, calculating, and conscious.” (157) Calculation for Aagaard is not merely ‘seeing variations.’ It involves “finding variations you do not see intuitively.” We improve our calculation by slowing down and actively searching for moves and ideas that are not intuitive, or those that we do not immediately see. This is Kahneman’s System 2 in action, and while Aagaard is careful to remind us that we must not over-rely on our calculative abilities (167), it turns out that even the World Champion could stand to activate System 2 from time to time. After playing 25. ..exd3 in his victory over Peter Svidler in the 2013 Candidates Tournament, Carlsen was asked about 25. ..Bxh3! in the post-game press conference. 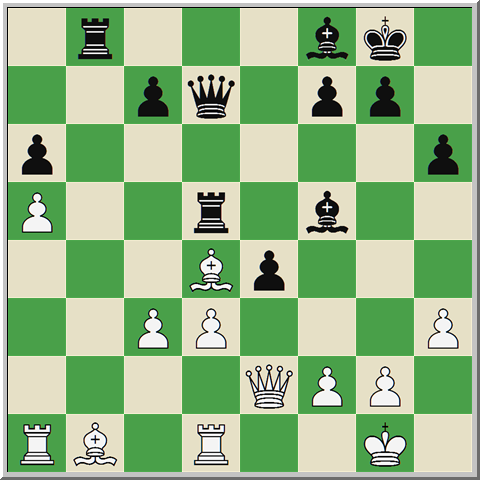 The idea is brilliant: after 26.dxe4 (26.gxh3? Qxh3) 26. ..Rg5 27.g3 Bg4 28.f3 Rb2!! 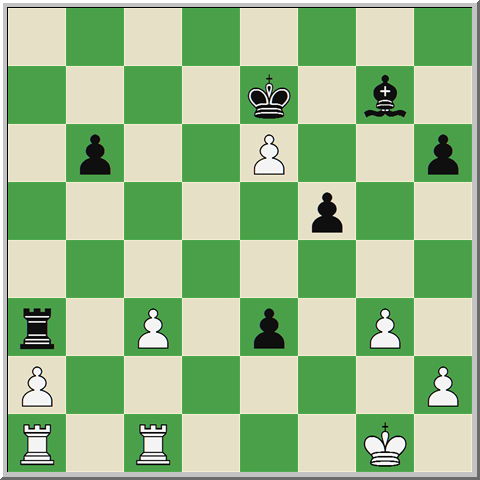 29.Qxb2 Bxf3 Black’s attack is irresistible. Very few chess books have stuck with me the way that Thinking Inside the Box has. I think it is Aagaard’s finest work, filled with useful insights, and I find myself reflecting on it frequently as I play and study. It is not an easy book by any standard, but I suspect that most players seriously looking to improve and capable of self-criticism would do very well to read it. This entry was posted in Instructional, navel-gazing, US Open and tagged Aagaard, Daniel Kahneman, Grandmaster Preparation, Grandmaster Preparation Thinking Inside the Box, Jacob Aagaard, Thinking Fast and Slow on October 7, 2017 by fullcityplus. I became a father last week – a first-time father! – so I expect that posting will be sporatic for a month or two. There are reviews in various stages of completion on my hard drive, but bringing them to ‘print’ depends a lot on how much sleep I get these next few weeks! In the meantime, I did want to point my readers to an interesting piece by Jeremy Silman on “The Best Chess Books Ever.” The title is a bit misleading, as I understand that at least a few of his respondents were asked about their “favorite” books and not those books they thought objectively best. Still, it’s a very interesting read, and some of the comments are also worthwhile! This entry was posted in navel-gazing on January 14, 2015 by fullcityplus.